Soju(소주):Many people are aware of the fact that Koreans love drinking and when it comes to drink Soju,the famous drink of Korea come across our mind. In Korea young and old,male and female equally like soju. Soju is a part and parcel of Koreans and it is also use in performing rituals. Soju is the best known liquor from Korea. It is distilled, vodka-like, rice liquor with high potency and often flavored similarly.It is clear in colour . Because of its ready availability and its low price relative to other alcoholic beverages, soju has become one of the most popular alcoholic beverages in both Korea and Asian restaurants & bars offseas. Though traditionally made from rice, most major brands supplement or even replace the rice with other starches such as potato, wheat, barley, sweet potato, or tapioca (called dangmil in Korean). Although beer, whiskey, and wine have been gaining popularity in recent years, soju remains one of the most popular alcoholic beverages in Korea because of its ready availability and relatively low price. Most of the restaurants serve soju. And samgyeopsal(Pork BBQ)serves well with soju. Asaba: As mentioned above India with its diverse cultures has many unique cultures and some of them resemble the cultures prevalent in East Asian countries whether in food habit or ritual ceremonies.In the North-eastern part of India there are such people or communities which have unique culture which are quite different from the rest of the country but less visible or heard. This region has some of the most exotic cultures and people and quite close to other South east Asian countries racially as well as culturally. One particular province in the eastern part of the country is Manipur, bordering Myanmar. People of this region are racially Mongoloid and culturally similar to South east Asian countries. Asaba,the local liquor literally means 'hot'.It basically derives its name from the burning sensation it gives at the throat while drinking it.It is also referred by different terms like Jou,Yoo-ngou etc. It is a distilled liquor and it has a bitter taste unlike Soju,which is sweet.In the past there were communities which produced Asaba for ritual purposes and some of them are still carrying on the tradition. In fact most of the communities in this region have similar rice made liquors as rice is the staple diet of the people in the region. But unlike Korea people here normally do not drink with the family members and it is often regarded as a taboo except for few communities. Like Soju,Asaba is the preferred drinks amongst the locals as it is cheap and readily available.And many people have made it their source of income.But still it lacks the needed technical equipments for better production. Although nowadays its hard to get undiluted, pure and good Asaba in the city,one can still manage to get good ones by traveling to the outskirts. One who is quite familiar with Soju will not have much problem in trying Asaba and the same is true for the opposite. 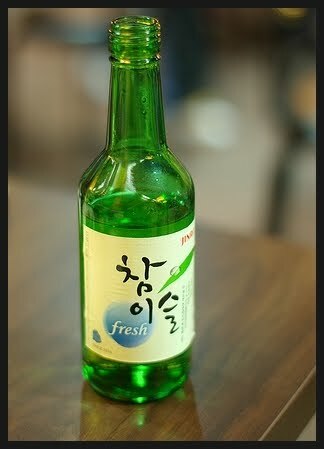 When I first tried Soju I had not much difficulty in taking it down,though sweet taste made me feel little strange. But later on I got used to it. Soju is a standard menu item at any Korean restaurant but buying soju by the bottle can be a little tricky even in big cities like New York but it’s worth the effort. Beautiful written blog. thank you for sharing.